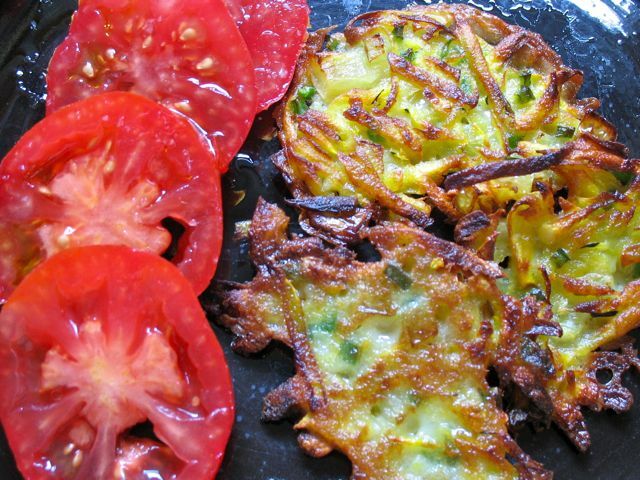 Fritters can be made of almost any vegetable (just avoid wet ones like tomatoes). In this recipe you fry them pancake flat, in a shallow depth of hot oil until their edges become lacy and crisp, much like a potato pancake. Depending on the vegetable(s) you choose, you can serve fritters with tart accompaniments like salsa, tomato sauce, chutney, Greek yogurt, or just sliced and salted tomatoes. Crack the egg into a small bowl. Add the water, flour, cornstarch, salt, and pepper. Whisk together until batter is smooth. Put the vegetables and any desired seasonings into a medium bowl. Add the batter and stir the mixture. Heat a wide skillet with 3 or 4 Tbsp. oil over medium-high heat until the oil is very hot but not smoking. The surface of the oil will shimmer or ripple when it is ready. Very carefully, add 2 heaping tablespoons of the fritter mixture to the skillet, and flatten with the back of a fork until the fritter resembles a pancake. Repeat, leaving room between the fritters. Cook for about 2 minutes each side, or until the fritters are golden brown. Use a spatula to remove the fritters from skillet onto a plate lined with paper towels. Continue cooking the fritters in batches. Add additional oil as needed. Fritters may be held in a warm oven but are at their best when served freshly fried. Grate firmer vegetables such as winter squash, zucchini, and root vegetables. Zucchini should be salted, drained, and squeezed of excess liquid to prevent fritters from spitting in the hot oil. Trim and finely chop or dice wild and cultivated mushrooms. Finely chop peppers if using. If using sweet corn, boil kernels for 3 to 4 minutes before adding to the fritter batter. Strip greens from their stems, and chop the leaves.